The second largest island in the Dodecanese is the charming island of Karpathos. Situated between the island of Rhodes and Crete, Karpathos is an island with a vast and rich history dating back thousands of years. Discovered on Karpathos were the remains of settlements that date back over 6000 years. The island is one that has culture and heritage on each and every corner. Karpathos is a truly beautiful island, with a landscape that creates an exceptional setting for your holidays in the Dodecanese. The green mountains and the golden sandy beaches blend perfectly together, forming a paradise in the Aegean sea. The famous Mediterranean seal "Monachus-Monachus" lives on the island due to it's exceptionally clean waters. Karpathos is an island where nature thrives, and it is a popular destination for travellers looking for alternative holidays. There are many paths that one can follow, taking you on a journey past the stunning scenery, the beautiful beaches, and also some spectacular caves. 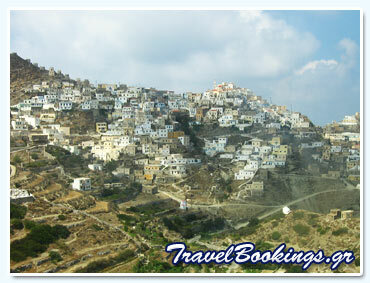 The capital town of the island is Karpathos ( the islands name ), but it is also known as Pigadia. The traditional houses and the beautiful church make it feel as though one has stepped back in time. All over the island are an array of many beautiful towns and villages, each with their own charm and magic. Arkasa, Makris Gialos and Lefkos are just some of the interesting towns that are well worth visiting. Below you will find information about the current accommodation and hotels that we have available on the island of Karpathos in the Dodecanese Islands of Greece. For more information about the accommodation or hotel, or to check availability and rates, simply click on the corresponding button.